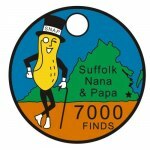 As most of you know, Nana & I have been on a really nice geocaching trip the last week or so. But before we get to the highlights of our trip there is an upcoming event that needs to be talked about. We will have a guest speaker from Hampton Mosquito Control. He will be giving a presentation including the latest information on the Zika virus. plants, and general safety tips!!! 3rd Tuesday Pizza & Beer - with a guest speaker! The Swedes are leaving town! Hint: You Do Not Want To Miss This Event!